On Monday, August 28th UVM Dining served up its first scoop of ice cream made with UVM milk since the closure of UVM’s Carrigan Hall, home to the original Dairy Bar from 1950-1995. In collaboration with UVM CREAM (Cooperative for Real Education in Agricultural Management), St. Albans Cooperative Creamery, and Wilcox Ice Cream, the Davis Center is now home to a new ice cream vision. How did we bring it back? We prioritized Vermont First. 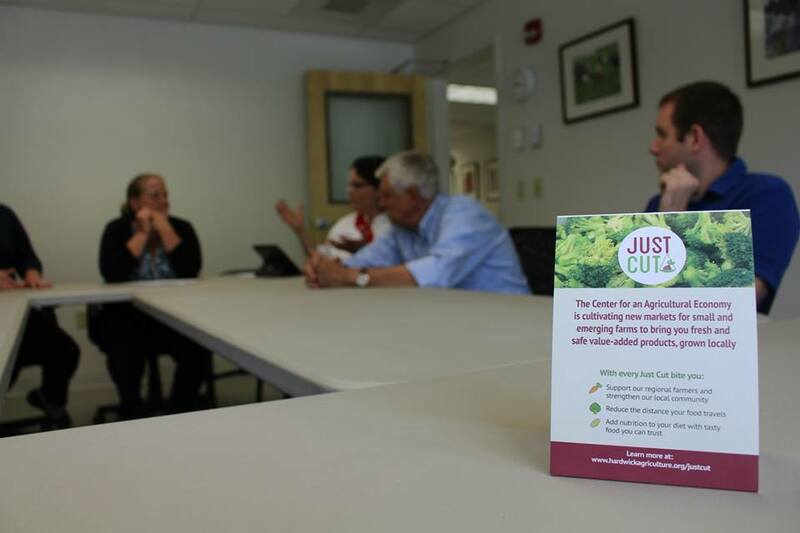 UVM Dining has committed to working with farmers, distributors, processors, and supply-chain players in Vermont before we look elsewhere. It’s all based in our pledge to bring farm to our institution. The UVM ice cream journey starts with the high-quality milk from the College of Agriculture and Life Sciences’ very own CREAM program. Located at the Miller Research Educational Center on Spear Street in Burlington, Vermont, CREAM is a student operated dairy farm. With 34 Holstein and Jersey cows, this superior herd has plenty of milk to spare for our ice cream. Through the hard work of both cows and CREAM students, the milk continues its journey to St. Albans Coop Creamery in St. Albans, Vermont. 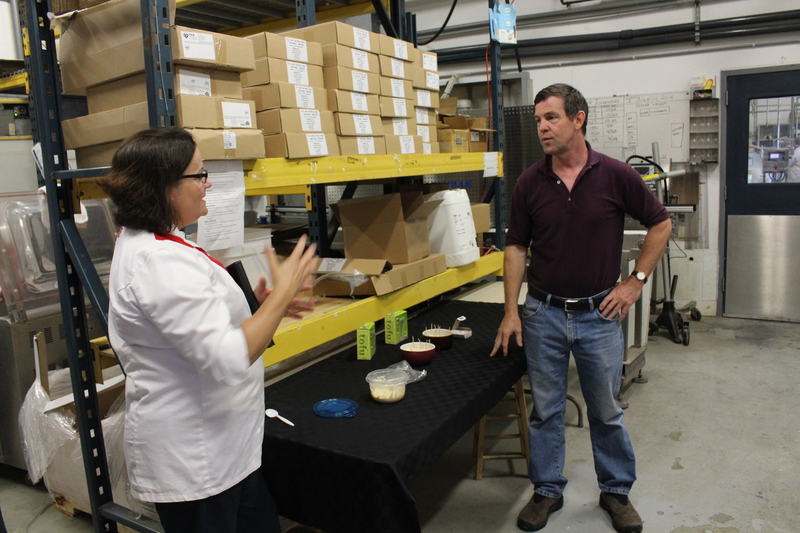 St. Albans Coop has been making dairy products for nearly a century. With the arrival of the milk from UVM CREAM, farmers create a delicious ice cream mix. That mix will soon find its way to Wilcox Premium Ice Cream in East Arlington, Vermont. Why Wilcox? Howard Wilcox, ’66, Animal Science, first learned to make ice cream from his father. At UVM, Howard was one of the few students making ice cream in the original Carrigan Hall Dairy Bar. 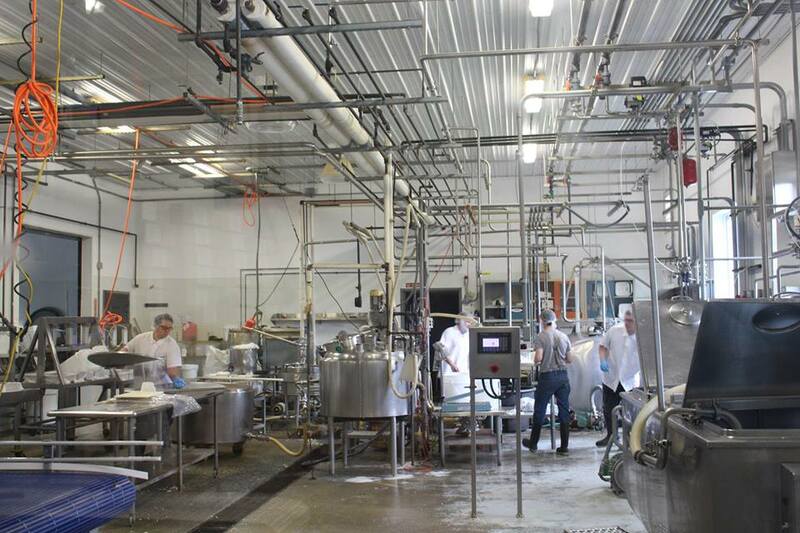 Today Wilcox Premium Ice Cream uses pieces of equipment from the original Dairy Bar in their operation. Howard, Christina, Craig and the rest of the Wilcox crew take the ice cream mix made with milk from UVM CREAM to create a variety of fantastic flavors. From “Sweet CREAM” to “Melody Mint Chocolate Chip” there’s a flavor for everyone. A portion of sales from the ice cream sold on campus even makes its way back in support of the CREAM program. But that’s not all! This space is also home to a new smoothie selection. Made with organic fruit and utilizing Fair Trade bananas, we recognize ice cream isn’t for everyone. Whether you’re in the mood for Maple Blueberry (made with pure Vermont maple syrup from UVM’s Proctor Maple Research Center) or Triple Berry, stop by the Dairy Bar to fuel your day. We’ve worked hard to keep the tradition of UVM ice cream alive, so head to the 2nd floor of the Davis Center to give it a taste yourself. How can Vermont First help create connections between Vermont accounts and Vermont producers? I asked chefs and managers of our Vermont campus accounts that I visited this spring. “Easy,” Rob MacFarlane, the General Manager of Castleton State College, offered. “Get people out visiting places.” I couldn’t agree more. An excellent place to start. 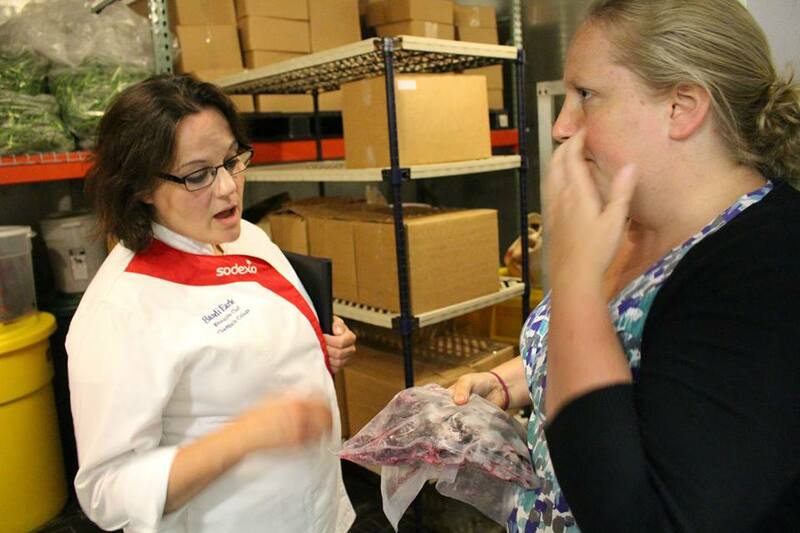 – Community of chefs and managers at Vermont accounts, building awareness within Sodexo surrounding the goals of Vermont First. 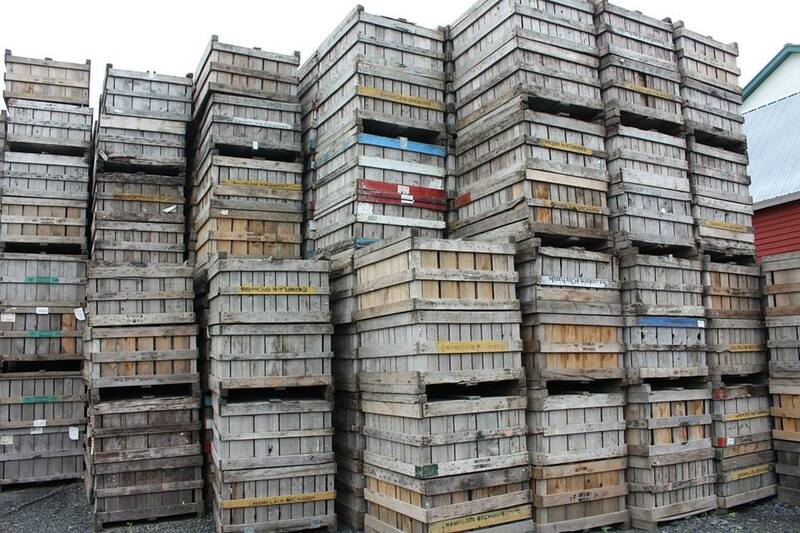 Champlain Orchards: It’s hard to leave Champlain Orchards and not feel passio nate about everything apple. Sandi Earle, Executive Chef at Champlain College, met and thanked the crew who make the apple pies she serves in her dining hall. We watched an incredibly efficient crew pack the remains of last years apple crop into retail bags. We poked our heads into the newly constructed cidery. We ended with a stroll up the hill to see the new apple trees. Vermont Sweetwater Bottling Co.: As we see more and more maple-based drinks enter the market, it becomes increasingly apparent how mu ch Vermont Sweetwater was ahead of the curve years ago. The company began with a Vermont Maple Seltzer in the mid-1990s, made using sap from their neighboring sugarmakers in the Poultney area. In a retro-fitted dairy barn which houses all of their production and storage, we sampled their creative additions to the product line of natural sodas, with flavors like Rugged Mountain Root Beer and Mango Moonshine. 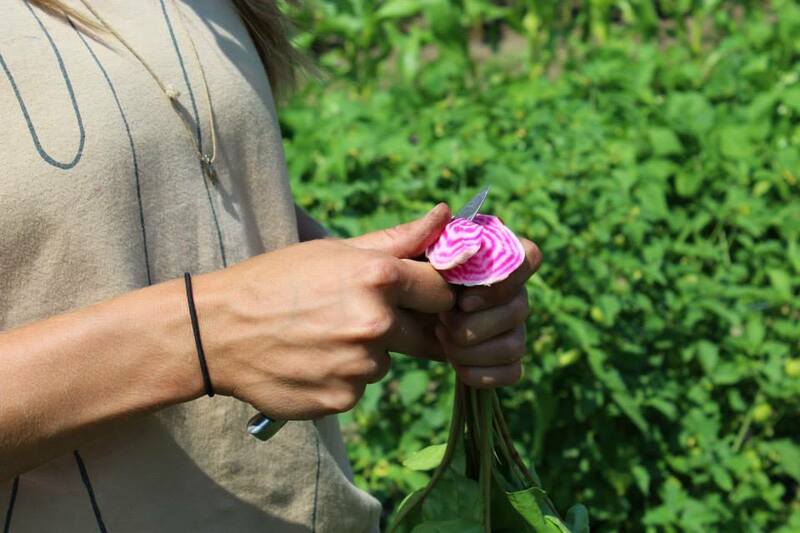 Intervale Food Hub: Less than a mile away from the UVM campus, Interva le Food Hub aggregates products from farms across Vermont and distributes throughout the Burlington area. 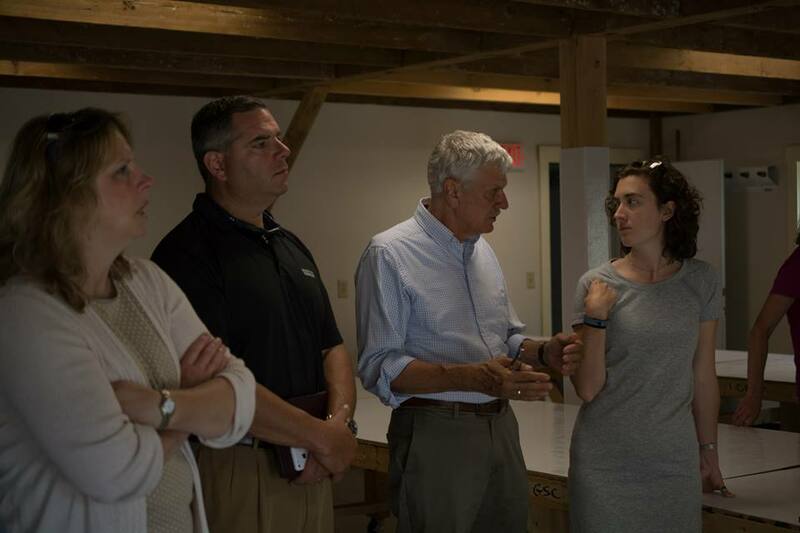 This was our first visit since Intervale Food Hub became an approved vendor this summer, becoming a gateway for many small to mid-scale farms to sell into UVM. Our team got to see the packing room where all products get aggregated and packed out to then be delivered to three sites on UVM campus. Thanks to Bobby Young and Sona Desai at IFH for being great partners! 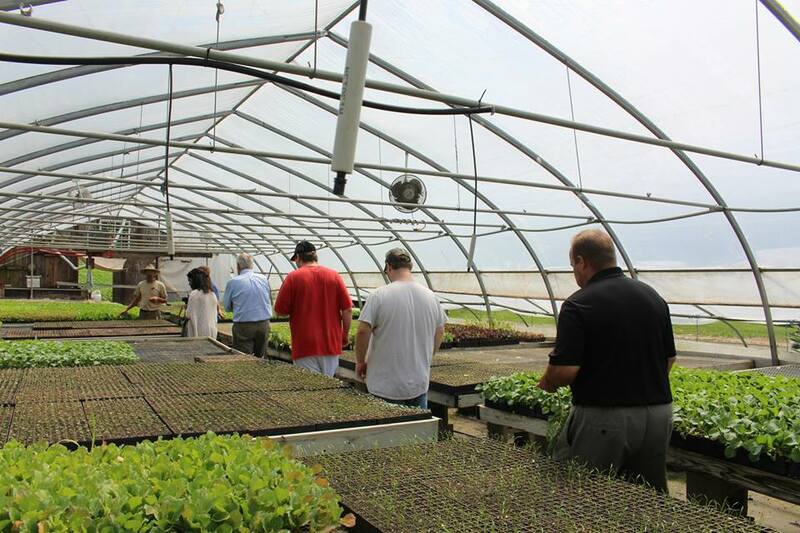 Intervale Community Farm: Manager Andy Jones feels that member-owned Intervale Community Farm has done something right to have a model that has worked for 26 years. I agree. Opening the door to their new greenhouse packed full of tomato vines, Andy explained how they expect to produce over 20,000lbs of tomatoes out of this one greenhouse. As Andy fielded questions, it was apparent how the combination of his experience, technical knowledge, calm manner, and calculated approach to farming were a good example of the “something right” that has dictated this long life of ICF. Diggers’ Mirth: Part-owner Hillary Martin made it clear to our group that the word “mirth” in Diggers’ Mirth is truly a fact of life on this farm. Quality of products grown at Diggers’ Mirth as well as quality of life seem to hold equal weight. Since 1992, they have enjoyed slow growth, experienced very little debt, and have enough shared responsibility to not over-tax any of the owners and workers. 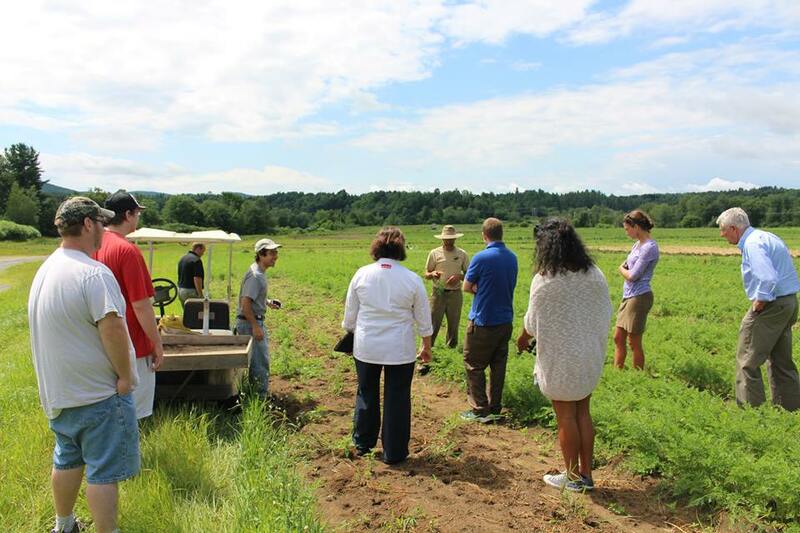 Catamount Farm: It seemed only fitting that chefs and managers f rom UVM should visit the UVM farm, Catamount Farm. 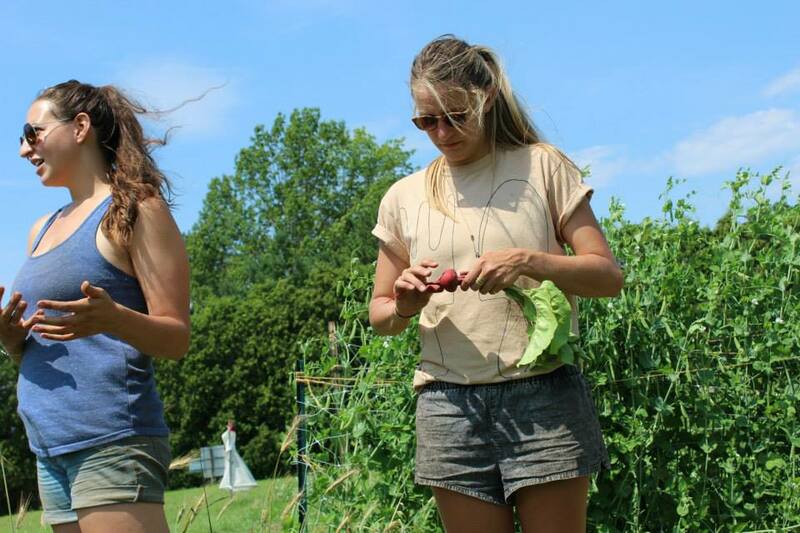 Our tour guides, Isabella and Amanda, were part of the UVM Farmer Training Program, a 6-month intensive training program for aspiring farmers and food system advocates. In addition to seeing where our food comes from when we purchase from Catamount Farm, we got to see first hand all that Isabella and Amanda have learned in just a few short months of being in the program. To top it off, Isabella whipped out a pocket knife to slice off some vegetable samples during our stroll through the fields. Vermont Soy: I have to be honest here – the places we visited with this group had a degree of interconnectedness that I had not planned for. As we entered Verm ont Soy, Michael Carr, Business Manager, asked if we were indeed going to Boyden Valley Winery later that afternoon. Yes, I confirmed. Michael went on to say how the Boyden’s had just planted a large crop of soybeans for Vermont Soy, and circled around to explain that the okara, a by-product from tofu production, then went back to the Boyden’s to feed their cow herd. Since 2007, Vermont Soy has worked closely with Vermont farmers to grow soybean to be used in Vermont Soy products. Tom Fondakowski, General Manager at Johnson State College, explained how he likes using the tofu scramble product from Vermont Soy in residential dining. Center for an Agricultural Economy: Just across the street from Vermo nt Soy sits the 15,000 sq ft facility of the Center for an Agricultural Economy, the home of the Vermont Food Venture Center. For full disclosure here, this is where I worked before coming to Sodexo! A lot has happened since my last day back in February, from new products being made to new equipment coming in the door. In addition to the community building, market development for farmers, and food business incubation work they are known for, what’s clear in walking away from a tour with Connor, Sarah, and Alissa is that they’re a great team. 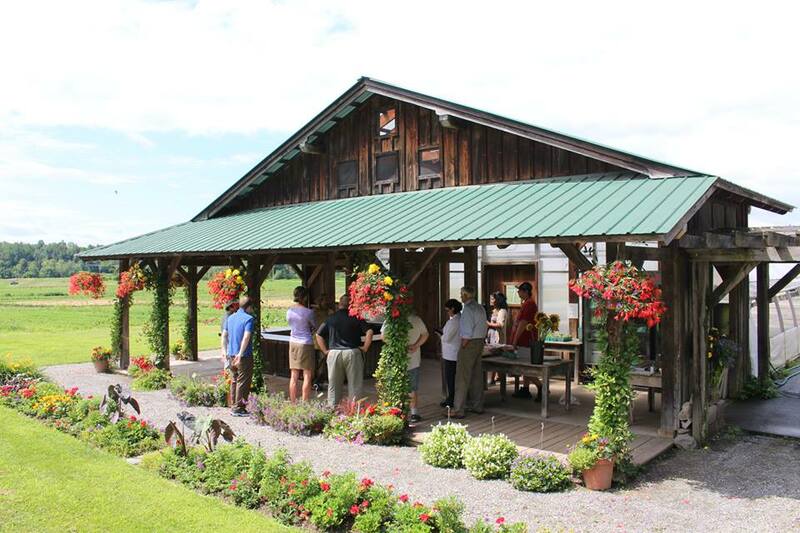 River Berry Farm: A backbone of organic farming in Vermont, River Berry Farm knows what they’re doing. In Fairfax since 1992, they chose their spot for the river bottom soil. After we arrived, co-o wner Dave Marchant pulled up in a golf cart, having been harvesting greens in a distant field. I think one thing I deeply admire about experienced farmers is their ability to quickly calculate what “makes sense.” When asked about the history of the farm stand that we stood in while talking with Dave, Dave simply responded it was the result of needing a place to send folks who stopped by looking for a head of lettuce. So he built them a farm stand that operates with an honor code system. Create your own market that requires very little management to run – makes sense. Boyden Valley Winery: Going on their 5th generation of ownership and business management, the Boyden’s are a staple of Vermont’s farming economy. Operating at least five different businesses under the family name, from maple produ ction to a winery to an event center to growing soy beans for Vermont Soy, they have discovered a way of creating business opportunities between and within generations on this, rather large, plot of land. For more photos from our travels, check out the UVM Dining Facebook Page.